The Celtic board have called on fans to stop singing offensive songs, including sectarian abuse aimed at Hearts boss Craig Levein. The issue was brought up by a Celtic supporter during the Q&A portion of club’s annual general meeting (AGM). 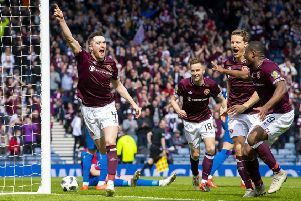 Referencing sectarianism aimed at Levein and Rangers manager Steven Gerrard, along with pro-IRA chanting, the shareholder expressed his concern that these songs have become more prevalent in recent years. Speaking directly to the board, he said: “I feel there has been an increase in sectarian chanting including calling Levein an orange b******. “‘Cheer up Stevie G...’ we are better than that. It shames us, it embarrasses us. “The song originated from the Rangers support as sectarian abuse to Tommy Burns and now we are doing it. Embarrassing. “I’m not putting all the blame on the Green Brigade but drums and megaphones bring the beat for these unsavoury songs.